Begin a new path of personal discovery and recovery! Discover & Recover is an effective resource for churches and Christian recovery groups, as well as for personal study. 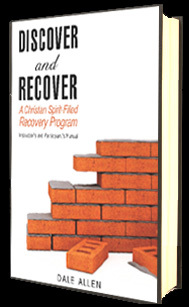 Discover & Recover will help to: • Eliminate insecurities, guilt, and painful issues of the past • Bring you into right relationship with God and to be filled with His power • Bring freedom from addictions and bad habits • Understand yourself better • See yourself the way God sees you • Understand spiritual growth and begin to grow spiritually • Live a godly life daily • Hear from God and move into His destiny for you • Equip you to help and minister to others Dale Allen came into recovery from alcoholism, drug addiction, and severe depression in 1974. Then, in 1978, he came to know Jesus personally and was filled with the Holy Spirit, which brought the true victory and freedom he sought in his recovery. Dale now teaches the principles that he has learned through his years of experience and study. Dale has been a full time addictions worker for 10 years. He and his wife, Delaine, head up Lifestream Ministries International, preaching and teaching the Word of God, and are part of the leadership team of their home church in Regina, Canada. They are the parents of two grown children.